Which is really the best cordless drill for your home DIY? Which are easiest Cordless Drills to use and the most reliable? What are the best Cordless Drills? Not Just Fluff and Sales! Which cordless drills are really worth their money and which are giving their users problems on the aftermarket? 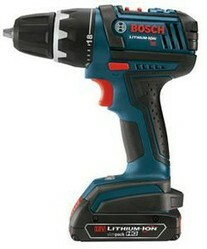 A cordless drill should be for life not just for Christmas or your birthday! A drill that is only going to last a few weeks before the chuck is stiff and the motor burnt out is of no use to anyone. This article is not just going to say these are the best cordless drills on the market I will also tell you what problems people are having with these drills after they have purchased them and the service levels they have experienced when they have tried to have things repaired. If you look on Amazon, one of the most reliable places to buy tools, you will see that the customer reviews for the Bosh range of 18V drills are all very complementary, most scoring 5 starts. The only things that most people mention as being cons for this particular drill is the lack of an on board drill bit holder and no built in level. I have searched for problems for this range of drills across various forums and can only really find a very few reports of switch/battery problems where the drills do not function. But these are very few indeed! Where people have had to use the Bosch service center product is normally turned around rapidly and efficiently. I would recommend this drill also! I have found quite a few reported problems for this cordless drill, many new owners report wobbly chucks and battery problems amongst others. Whilst the majority of reviews are positive there do seem to be a significant number of quality problems with new products. If it is OK out of the box however it appears that you will have got yourself a reasonably reliable, rugged and hard working cordless drill capable of completing any job around the home! When people have returned their drills for service and repair they report a good and rapid service from the service center. Another drill with quite a few reported problems out there; customers report wobbly chucks, battery charging issues and motors that burn out easily! But again a large number of highly satisfied users also. It seems as with the Dewalt above there is some variation within their manufacturing that is causing a significant number of quality issues that get to reach the customers. However if you get a good Makita Cordless drill most users report them as being very good workhorses, although a few complain still about battery life and charging times when compared to some other brands of drills. Another leading brand of cordless drill that is being let down by quality issues across its range, although the drill has few if any reported problems there are many reports of problems with the batteries for this range of cordless drills which make them a poor choice. The drill itself is always reviewed very well, but users complaining about battery power and life, especially after about a year. Many people dismiss black and decker cordless drills, I have one that I use quite regularly and have no problems with it. However compared to the other drills in this list the B&D is a lightweight tool that lacks the power of the others. However if you only do lightweight around the home DIY then this tool is reasonably reliable and CHEAP! So if price is a major factor and you don't tend to do major DIY type jobs around the house then this cordless drill is an ideal one for you. I felt I had a chance of winning the contest for America's Most Desperate Landscape. When a slow internet connection prevented me from entering I took on the challenge myself.